It’s 18 months since I first stashed this yarn to make a Market Squares bag for a dear friend. She was with us when Isabelle was born and we are hoping she will be able to make it (from interstate!) when this little one arrives. So this yarn was the first thing I pulled out once I finished the baby knitting. I did look at the Market Squares pattern, for a couple of days in fact. I even cast on. Three or four times. But in the end it was more than my pregnant brain could cope with and so I returned to the old faithful French Market Bag, with my favourite mods. 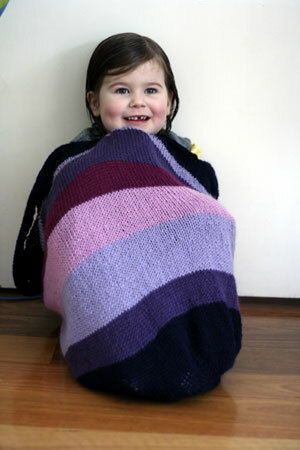 No Market Bag production experience is complete without the knitted bag being thoroughly tested by Isabelle. She’s grown a little in the last 18 months! All it needs now is felting, which requires time with the washer, something that is in short supply at the moment. I feel like I have been washing 4-5 loads of washing a day for weeks. I probably haven’t been doing quite that much washing, but I tell you, it’s close. Jo, that bag is going to be a stunner…those colors are fabulous. And Isabelle has gotten so big! (But that cute little face hasn’t changed.) Hope you’re doing well. 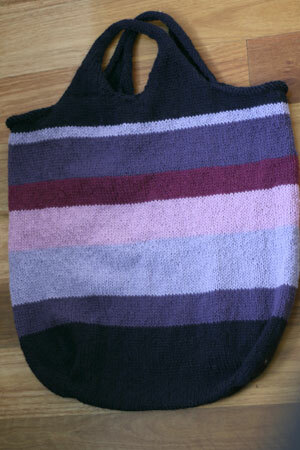 Gosh, this bag is absolutely gorgeous, I love the colors you’ve been using! And your little one is such a cutie, such a lovely smile that she has - already a very beautiful young Lady! Gorgeous colors on this bag, I can’t wait to see how it felts up :) But of course, that little lady IN the bag outshines it by far, what beautiful dimples! I love the bag and what a little beauty inside! What wool did you use for it - I have only used Lambs Pride for felting.
) and seriously, what is up with laundry! Our hamper is ALWAYS full regardless of how much time I spend with Mr. Washie! love the bag and the colours you used!! i can’t believe how much she’s grown! but they do that, don’t they? she’s beautiful. you’ve been making lovely stuff.